"If you don't like it, you can't send it back!" The Future of "Eat It"
Would you like to see Al retire "Eat It" from the live setlist? Yes! Twenty years is long enough of a run. It's time to give that song a rest. No way! That song made him a star! He owes it to us to keep performing it! I don't care one way or another. The end of the medley is the best place for it. Once in a while, a musician will release a song that will become both their greatest hit and the bane of their existence. By 1984 Al was already on his way up. His self-titled debut album didn't break any sales records, but it made a nice showing considering it was the first album by a comedy artist that most of America wasn't really familiar with. Plus, Al had gotten his foot in the door at MTV, which helped get his name out in the public by adding "Ricky" and "I Love Rocky Road" to its rotation. In February Scotti Bros. released Al's second album, "Weird Al" Yankovic In 3-D. As fine of an album as it was, featuring parodies of such overexposed artists as the Police and Greg Kihn plus numerous excellent originals, it was its lead-off single that would define Weird Al for the next decade. As a song alone, "Eat It" was a goofy yet charming send-up of Michael Jackson's hit from the year before, "Beat It." There was a lesser need then to mimic the original's sound exactly as there has been on the more-recent albums, so silly vocal effects and Musical Mike's "musical hands" gave Al's parody a light-hearted feel, perhaps as a way to diffuse whatever double entendre could be made from the title. If it hadn't been the MTV era, "Eat It" probably could have done just fine on its own. But it was in fact the video that made the song a hit, thanks in large part to MTV deciding to always air it immediately after Michael's video. An almost shot-for-shot spoof of the original, "Eat It" caught MTV audiences with their pants down. Al not only proved that his humor wasn't limited to just music, but also that he was a hip, likable music-video star. The video turned Al into a household name, and the single ended up hitting #12 in Billboard, going Gold in three countries, and earning Al his first Grammy and an American Video Award for Best Male Performance. Whether or not "Eat It's" success was all luck or precisely calculated by Scotti Bros. is another question. In any case, the In 3-D album went along for the ride, reaching #17 in Billboard. The album's second single, "King Of Suede," was without a video yet still got as far up as #62 on the singles chart. The third single, "I Lost On Jeopardy," didn't fare nearly as well at #81, but it did become the album's second video, making sure that Al was planning to be more than just a one-hit wonder. However, as with any sudden success, the fame Al received from "Eat It" also had its down side. Until the early '90s, Al was more or less known as "The 'Eat It' Guy," a nickname Al just wasn't able to escape despite releasing four additional albums and a feature film (of course, the fact that he parodied another Michael Jackson hit in 1988 might not have helped matters). Despite albums such as Dare To Be Stupid and Even Worse doing well in Billboard and going Gold soon after their respective releases, many had written Al off as being a one-trick pony. Even his own record label tried to typecast him by releasing a compilation in 1993 called The Food Album. It wasn't until Al released such parodies as "Fat" and "Smells Like Nirvana" was the public able to see him as more than just "The 'Eat It' Guy." "Eat It" would go on to win a Grammy for Best Comedy Recording, while the video itself would earn Al an American Video Award for Best Male Performance. 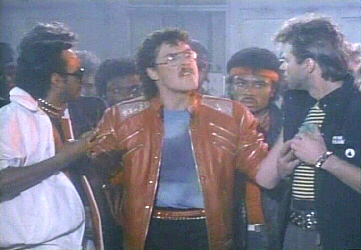 Weird Al was now a star. During that year, though, "Eat It" did open a number of doors for Al. He was offered a Diet Coke commercial, in which he dressed in his "Eat It" outfit to parody the fact that Michael Jackson was Pepsi's current spokesman. Al would travel to Japan to promote the song, where it was also released in Japanese (but not with Al singing) and as a karaoke track. And Al and the band spent half of the year touring the United States in their first headlining tour while also getting some high-profile TV gigs. Speaking of television, the success of "Eat It" also prompted MTV to let Al host two four-hour specials called Al-TV, once in April and again in September. Al was able to not only air his own videos, but also videos from other quirky artists he felt MTV had neglected, sketches parodying commercials and MTV, and introduced the world to his best friend in whole world, Harvey the Wonder Hamster. The two Al-TV specials proved to be so popular that it became a tradition on the network with almost every new Al release. MTV would air a total of eight Al-TVs from 1984 to 1999, while VH1 would continue the tradition with a ninth show in 2003. Twentieth Century Fox would even take advantage of Al's newfound fame by asking him to write and record a theme song for the studio's upcoming gangster spoof Johnny Dangerously. The song, "This Is The Life," was a fun, catchy, ragtime-styled original number that showed that Al could produce entertaining songs without relying on the success of another musician. Though the movie bombed (despite a new video of the song to help promote it) and the song would be missing from home-video copies until 2002, "This Is The Life" would go on to become a fan favorite. The lasting success of "Eat It" is only more amazing when one considers that after 1984, Al was more than ready to move on. The song would remain as a full live number for 1985's The Stupid Tour, but starting in 1987 a shortened version would get pushed into the centerpiece parody medley, where it has remained ever since. Al never again performed the song on television once his third album Dare To Be Stupid was released. He poked fun at the song in The Compleat Al by slapping the title onto a piece of "Weird Al edible underwear." And during 1996's Al-TV special, in what might have been quite a cathartic bit, Al shoves a hyperactive fan off a roof after he insists that Al sings the song. But unfortunately, Al may never be able to completely get away from "Eat It." While many see it merely as his first big step into stardom, many others only know about Al because of it. So whether one thinks of Al as "The 'Eat It' Guy," or they prefer to groan at the mention of "the 'E' word," there is no denying the song's importance to Al's career...and there's a good chance that without it, we wouldn't still be talking about Al in 2004. As it says on the back of the single, "Thanks Michael."